OverviewKing Neptune's crown has been stolen, and all evidence points to Mr. Krabs. Join Spongebob and Patrick on their journey to retrieve the crown and save their beloved friend from execution. Spongebob the movie game is an adventure-platformer that should be fun for eveyone to play. You must venture through a gauntlet of dangerous locations to retrieve a gold crown that was stolen by Plankton, and save a frozen Mr.Krabs from a firey fate. From scalng rocky cliffs to traversing lava lakes, it's an adventure of a life time. The game contains cutscenes straight from the movie and similar levels. The goal is to collect as many "Goofy Goober Tokens" as possible. Failure to have a preset amount of these tokens by certain levels, the game will force you to go to previous levels and find more tokens. Although the primary objective is to get lots of tokens, an important secondary objctive is to collect as many manliness points as possibe. These ponts look like little floating dumbells with a color coordinated glow. Red=1, Yellow=2, Green=5, Blue=10, and the rarest Pink=50. Most breakable objects and enemies yield these points and can give you different amounts depending on how much you currently have. 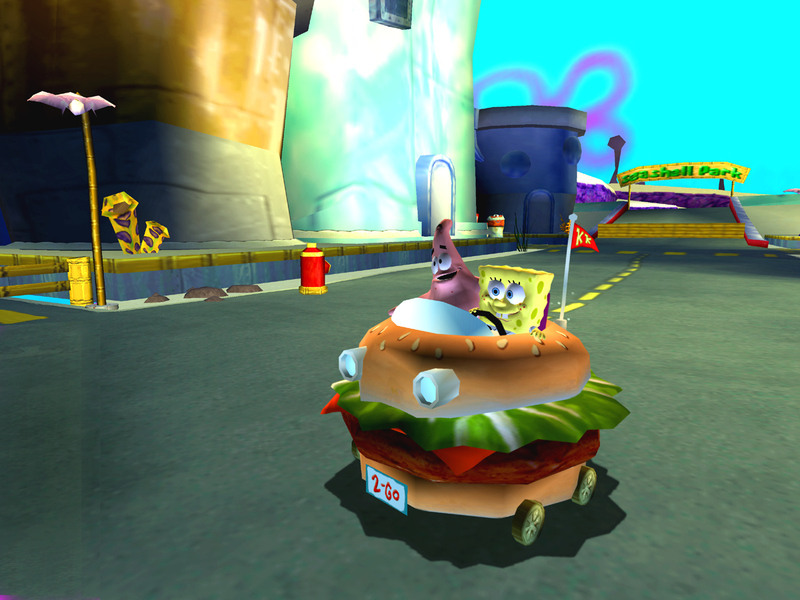 Throughout the game's non-driving levels, you control either Spongbob or Patric much of the time (of course you may need to switch for certain challenges). Many levels have these large, square tiles on the ground that teleport you to bonus challenges that reward you a token as the prize if you complete it. The challenges range from spongeball (navigating a sphereical Spongbob through numerous twists, turns, and obsticals), to floating block (guiding Patrick through a minefield of moving, spining, spiked, bouncy, and disappearing blocks. These are the hardest challenges in my opinion), to combat arena challenges (usually using Spongbob to defeat 3 waves of common enemies). As you progress through the game, these challenges get much harder. Other bonus challenges, which are found randomly, are the bungi (using Spongbob to break targets and avoid obsticals), and sonic wave challenges (Long, annoying challenges that require Spongeob to guide a sonic missle through tons of yellow rings and destroy the end target, you wont be able to do these missions until somewhere near the end of the game). Both Sponebob and Patrick unlock many unique moves that can be upgraded via collecting lots of manliness points into more powerful, better versions of the move. The driving levels feature two time challenges and one ring challenge. Oevrall, the game is a lot of fun, and progressively gets much harder. It's dfinitely worth a try. Now you can add videos, screenshots, or other images (cover scans, disc scans, etc.) for The SpongeBob SquarePants Movie to Emuparadise. Do it now!